This is a long post. Dip in and out as you see fit. Well done if you get to the end of it. 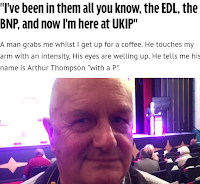 We came across a new UKIP blogger yesterday, a 'student of journalism', and we discovered an intriguing piece that was certainly fairly well written, a UKIP rarity indeed. However the poor chap seems to be studying at the 'Daily Express' School of Journalism, in that 'factual accuracy' and 'telling both sides of the story' seem to be entirely optional elements, and were replaced with 'lift huge chunks out of the various UKIP releases and repost without challenging them'. He's quite recently become a UKIP member, having just joined in May this year, around the time UKIP membership peaked, and just before the downward spiral of losing 10,000 members. He's a confirmed Eurosceptic, but we can't tell whether his Euroscepticism has led to his Immigration views or vice-versa. With UKIP supporters, it's often one or the other. Well, as he's a rookie in this game, we were interested in his article entitled "My 12-point argument against the notion that UKIP is a racist party". Surely there'd be something new in there for us to sink our teeth into? Something different? Sadly, a brief scan confirmed that it was pretty much straight from the UKIP manual, all the points we've seen before so many times, and each point easily defeated, a process we've gone through every time each argument is raised on our Twitter feed for the last three years. But we thought it might make a reasonable opportunity for us to collate in one place, all of the ripostes to the various claims made by UKIP on the subject of racism. Sorry, Oliver Norgrove, nothing personal - you just walked into our sights at the wrong time. 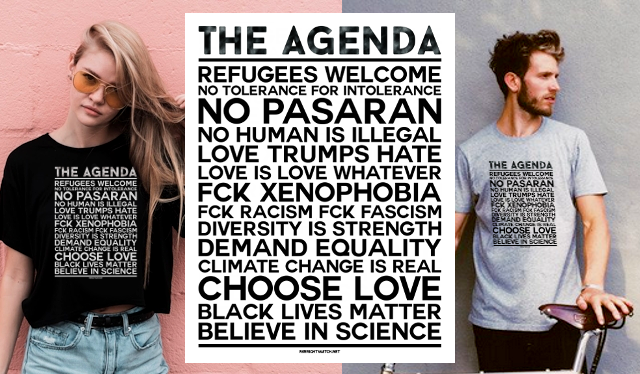 "A new liberal phenomena – known commonly as ‘Cultural Marxism’"
Okay, let's stop right there. Oh, dear, and it was going so well up to that point. For someone wishing to place himself as, dare we say, a more moderate Kipper, this phrase (just eight words in) is a clear pointer to his position. The phrase ‘Cultural Marxism’ is an oft-denounced 'Conspiracy Theory', dating from about 1920 - but the more modern variant has been popularized more recently by the right wing American Tea Party Movement. More pointedly, it is a favourite of American White Supremacists fighting the supposed 'White Genocide' i.e. White Nationalists, and was even quoted as a motivation behind the horrific crimes of Anders Breivik. Are you sure you want to be using this phrase, now, Mr Norgrove? "... avoid racist discourses and pretend to be defenders of democracy." "... a snarl word decrying everything right-wingers don't like, alluding to a conspiracy theory involving sinister left-wingers in the cultural and artistic spheres, including the media and academia, supposedly being engaged in a decades-long plot to undermine Western culture. With bonus Anti-Semitism." Damn, we could write a whole post just on the misuse of those two words. A strange choice, to pick such a Far Right phrase, for a writer who seeks to place himself in the middle ground. Terrific start, then. He then continues to give his own definition of 'Cultural Marxism' - which differs greatly from that of actual experts - which is here, by the way. Always easier to defend a stance when one can redefine it to suit. "It is, in a nutshell, the belief that those in society who hold conservative moral opinions towards these sort of issues should be branded as racists, homophobes and bigots by intolerant liberals." Okay. We don't 'brand' anyone as 'racist' for having 'conservative moral opinions'. After all, some of us here have a few 'conservative moral opinions'. We brand them as 'racist' for having actual 'racist opinions'. See the difference there? "And within this web of liberalised bigotry lies the unfortunate belief (among many others) that UKIP is a racist party." And indeed it is, as we have shown ad infinitum for the past 36 months - as we shall continue to show. Notice how the words 'intolerant' and 'bigotry' are clumsily batted back to the liberals like a live hand grenade? Word to the wise : this tactic rarely works. "My aim is not to convert, but rather to educate." Ah, good. He's been in the game a few months, we've been fighting racism in all its various forms for over thirty years. I'm sure he can teach us a thing or two. No sarcasm intended by the way. We're open to listen to new ideas. "Where does this ‘racist’ stigma come from? Unfortunately, UKIP (like all parties) has played host to a bigoted and very vocal minority." Yes, we know. We've 'outed' a fair few of them. We query his use of the word 'minority'. A Party, remember, is not just the Officials and Candidates but also its Members. One only has to follow the #UKIP hashtag on Twitter or any UKIP page on Facebook and one will see that, once left off the leash, members and ifficials ditch the Party line and go full-on nasty - especially in those 'Private Groups' where they think they are safe. Are we in there, watching? Of course we are. And this is where the racism tag starts to stick like mud. There's a fair collection - 89 from January 2014 to GE2015 and onwards - of former Party Officials and Candidates who have been ejected / suspended / deselected / forced to quit for various reasons, chiefly amongst them, racism and islamophobia. This Tumbler account lists them all. Throw in financial misdemeanours, antisemitism and homophobia and you have a full house with ace high. This is not a myth. this is documented, multiple instances. And the media scrutiny on UKIP for this is quite correct. 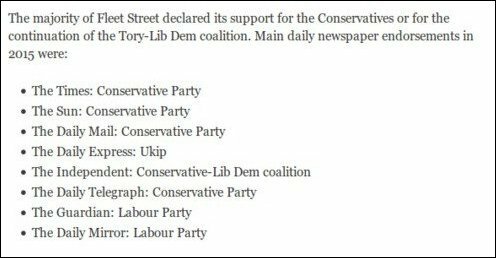 If UKIP seek to refer to themselves as a 'mainstream party', expect such scrutiny. They're playing in the Big Leagues, now. 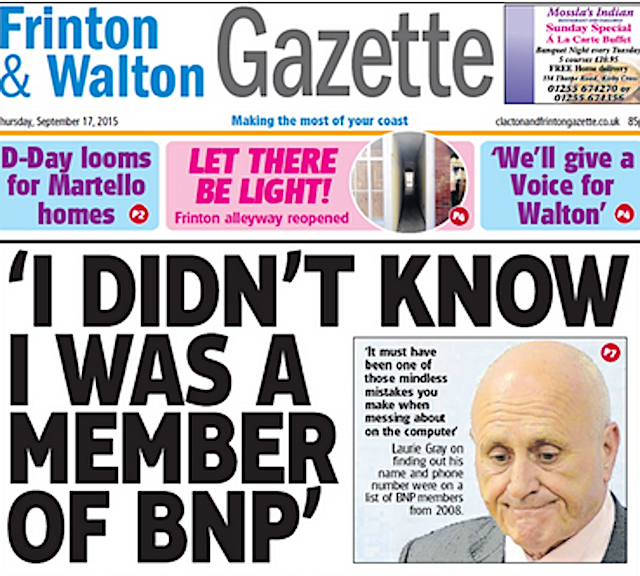 If UKIP show a documented, proven history of racism, journalists will be looking for it. Man up, grow a pair, and quit whingeing about 'smears'; And pretending they've been hacked; Or claiming they have fat fingers. "All idiots have subsequently been ejected from the party. Correct me if I’m wrong, but isn’t a party willing to kick out members responsible for stupid comments a party standing up to racism and bigotry?" Not if a Party 'kicks out' undesirables only once identified by outside agencies - media, web sites, social media. To our recollection there is not one single episode where UKIP have identified and ejected such a member themselves - only when forced to do so. UKIP don't investigate their own - until it's on Twitter. Doesn't seem very 'willing' to us. Seems more 'reluctant'. UKIP would be seen to be 'standing up to racism and bigotry' if they did their own vetting properly. It's still not being done. Plenty of racists remain in UKIP. If we, a group of unpaid part-timers, can find them, then UKIP, a group of paid full-timers, can. Either they just choose not to look - or we're just miles better than they are. It's UKIP's very own version of 'Don't Ask, Don't Tell'. by her own local Party. And we keep finding them. It's not hard. Documented racist Vicky Ayling, former Candidate (vetted) is now running for the Ukip NEC. Documented racist Anne Marie Waters has just been promoted (and vetted) to become a Candidate for the London GLA. 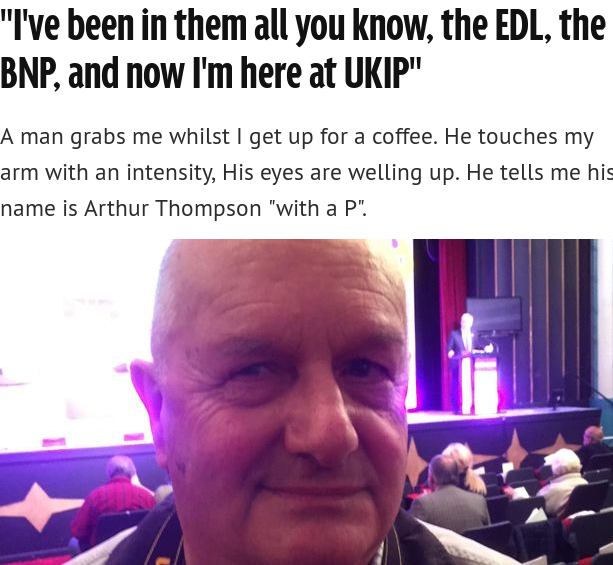 Documented racist and EDL/SDL supporter Arthur Thackeray (yeah, vetted) is somehow still Acting Chair of UKIP Scotland. So UKIP, if you want to show 'willing' - start with these three. "It seems to me that if the views of the idiotic minority were representative of the party’s beliefs and actions, then said people wouldn’t be so swiftly ex-communicated. Just a thought." The views of this minority are, indeed, representative of the party’s members beliefs, judging by interactions we've had with countless UKIP members on various platforms. But when in the media spotlight, UKIP have no choice but to eject. Against their will. If they could hide it, they would. And they've tried. "Why are we projecting the view of the minority onto the view of the majority? From a fair and proportional standpoint, I often question the need to assert negativity or blatant bigotry as the view of a political party .."
That 'negativity or blatant bigotry' is UKIPs trademark. Blaming the blameless, for the weather, for traffic, for long grass, for floods, is indeed bigotry. And this is what UKIP do. The answer to every question is either the standard knee jerk "The EU!" or the advanced bigoted "Immigrants!". We're glad he questions that. He, and many others, need to shout a lot louder. "A political party which actually employs a plethora of talented, reasonable and intelligent representatives." Granted. Plus, UKIP have got David Coburn and Tim Aker as well. "Why are members of the public extrapolating upon, say, Mark from Sheffield’s views about Indian people, instead of a rather more rational Steven Woolfe’s views on controlled immigration?" Because Steven Woolfe knows not to goof in Public. He's a politician. And he's quite good. Not that good. (But good enough to have Nigel checking his back daily). Because odds are, if 'Mark from Sheffield' has negative views about 'Indian people', he probably votes UKIP. 'Mark from Sheffield' is the demographic UKIP aim at. UKIP know full well that there are plenty of people who hold less than palatable views on migrants, race, colour and faith. All those votes, just sitting there. 'Mark from Sheffield' is the Party, and he represents the core UKIP vote. And he now feels safe in voicing his views. Why? Because UKIP have made it socially acceptable to be racist. "Hold on, what about morons in other parties? Are those parties racist too? Without meaning to shock readers, I wish to report that there have indeed been incidents as equally bigoted and discriminatory going on in rival political parties .."
Doesn't shock us. We know. To our count, since January 2014, we think 4 equivalent incidents (in other parties ten times the size) compared to 89 for Ukip. Add one or two more trivial incidents, we could call it 6 if we were being generous. "What do you notice about stories such as these, though? The answer: you don’t. You don’t notice them." We don't notice these stories in the media much because they simply don't occur very often. They are outnumbered by UKIP incidents probably, at a guess, ten to one. Maybe more. It's like UKIP have a monopoly on self-immolation. "...because they are stories that don’t coincide with the political agendas of various media outlets." They'd coincide pretty nicely with the agendas of The Daily Mail and Daily Express, wouldn't they? The Express put a story on the front page about Jeremy Corbyn's great great grandfather in 1867 so if there was any racial hatred in Labour or the Conversatives, the UKIP loving - and funding - Express would be plastering every front page with it. But they don't. Because it just doesn't happen very often. "UKIP consists of representation of a wide range of ethnic minorities, many of whom are running as councillors, or have stood for/plan to stand for parliament." Well, they were running. The numbers are much reduced now they've served their purpose, which was to be placed front and center at GE2015, for one photo call (in the Express, of course) and we never saw them again. A surprising number have disappeared without trace. Some of them are probably genuinely eurosceptic, and hold their noses to the other aspects of UKIP. Some, without doubt, are careerists, turned down as candidates by mainstream parties, and thus joining the one party they'd know that as a minority, they would be nominated as a candidate instantly, with welcome arms. After all, in GE2015, UKIP were scrambling for Candidates, by their own admission. Look how Racist we're not !! ... and they we're never seen again. Naturally none of these minority Candidates are were put anywhere within spitting distance of a seat where they actually had a chance. They knew it, UKIP knew it. Some will do this naively, some in full knowledge that both parties are gaining from the relationship. Khalid Khan is a very good example. No-one with that level of blandness and banality would be accepted by a proper Party. Amjad Bashir? Do you really want to go there? And the less said about Winston McKenzie the better - he's still under investigation for Fraud. By UKIP. 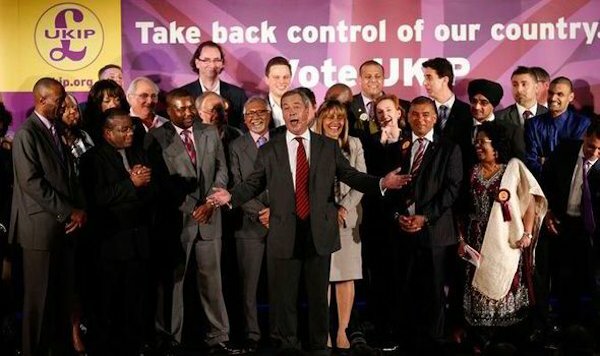 The Independent did a good article or why some minorities support, even run for, UKIP. "Growing numbers of Britain’s ethnic minorities (including those ethnically Indian, African and eastern European) choose to voice their support and vote for an alleged racist party." A big claim, and one that we would dispute, with no sources to back it up. Growing compared to when? Recently? The 2010 General Election? The Euros 2014? Last Thursday? The writer needs to quantify the statements and provide a source. He's training to be a journalist, perhaps they've not done the module about sources yet? UKIP were so badly mauled by the electorate in 2010 that probably every sector of the electorate showed growth of some kind at GE2015; when you're that close to bottom, the only way is up. It may well be that some ethnic minorities do support an anti Immigration stance, despite benefiting from it themselves. That's borderline hypocritical, we think. But each to their own. Oh - and actual UKIP vote share has fallen in all but four by-elections nationwide since the GE2015 - so if the ethnic minorities vote is rising we'd be very surprised indeed. "I can only assume that either these people have made a terrible mistake or..."
"UKIP does not have any racist policies. The party’s manifesto from the nation’s most recent general election, which can be read here, contains not even a whiff of racism." Yes, we agree. As prone as UKIP are to shooting themselves in the foot, not even Evans or Aker would put actual racist Policies in any actual Manifesto. But a Party is more than a Manifesto, especially one drawn up in the full knowledge they will never, ever, be called upon to deliver. But that doesn't mean UKIP doesn't have any racist Policies, just that they didn't make the final cut. Take Farage's policy, for example, that racism actually no longer exists, and that all Antiracism laws should be scrapped. Or Farage's policy that Christians (only) who discriminate against Homosexuals should be legally exempt from prosecution. But not Muslims. And yes, Islamophobia is classed as a Race Crime before you go down that well-trodden road. Don't point to the UKIP Manifesto. It's meaningless wallpaper. And nobody ever saw the UKIP Scotland Manifesto. Is it ready yet? "3.9 million people voted for UKIP in May 2015. Does this mean that millions of Brits support and endorse racism?" Well. In a YouGov Survey in 2014, just over half of UKIP voters wanted forced repatriation of immigrants including children born in the UK. This year, in The Independent, more than half of UKIP voters freely admitted they were prejudiced against other races. The rest ? Some are perhaps determined Eurosceptics with closed eyes. Probably a few other mixed reasons in there. Does it mean that all UKIP voters are racist? No. "Despite the criminally disproportionate seat tally awarded to UKIP earlier on this year..."
Based on the First Past the Post system, on which we criminally heard not a peep from UKIP, until they fell victim to it. Perhaps PR is better? You know, the PR under which the 'undemocratic' European Parliament selects it's MEPs? (but we digress). In fact, Ukip, knowing the weakness of FPTP - that targeting specific seats works better than spreading resources - did exactly that, with 95% of their funding focused on just 5 constituencies. They played the game - and still lost. "...the party did manage to amass 13% of the country’s vote share. In such a liberal and ethnically diverse country, you would be forgiven for thinking that four million Britons would show support for an institutionally racist organisation." “UKIP scapegoat migrants!" No, not quite." Even for 'traffic on the M4'. Even for 'Long Grass in Essex' For the NHS. For the Homeless. For Housing. For Schools. Here's Ten things Farage has blamed on Migrants. Anytime there's a Social, Political or Economic issue in the UK, for UKIP it's "the immigrants". When it's not "the EU", of course. Watch any UKIP interview. we have, we watch them all. If the EU is not blamed within 20 seconds it's a darn surprise. Scottish MEP David Coburn holds the current record at 4.81s. "Those that make comments like this have already totally misunderstood a much-needed immigration debate." We do indeed need a sensible Immigration Debate. Measured, and Fact Based. And until UKIP cease the reactionary politics of blame, we won't have one. In fact it could be said that UKIP's handling of the issue and distraction of blame is actually detracting from having the actual open honest Debate we need. "The immigration debate finally encircling this country isn’t about individual migrants." Perhaps UKIP should explain that to the Daily Express, and individual UKIP members who constantly blame individual migrants. Just a thought. "There is nothing racist about being patriotic and putting your own people first. If there was one point in this list I could hammer home most intensely, it would be this one." And no-one has said so. Nothing 'racist' at all about being Patriotic. However on a daily basis, extreme Right Wing groups such as the BNP, the EDL and Britain First - all of whom refer to themselves as 'Patriotic' - expel their own brand of racist ideology. Some people just can't tell the difference. It is perfectly possible to be Patriotic without being Extreme Nationalist, or racist. Neither BNP, the EDL nor Britain First have mastered this yet. UKIP are struggling. "There seems to be a select group in this country that despise the very existence of Britain or a British narrative." A very vague accusation - targeted against who? The Left? The Left are Patriotic. They just have a different vision for our Country's future. Don't ever try to claim that UKIP have a monopoly on Patriotism. As for "despise the very existence of Britain" ... Hardly. Lefties love Britain. They just don't want the Britain that UKIP want. "If a homeless British ex-serviceman is sleeping on the streets of Leeds, it makes sense to sort out problems on your very doorstep, before allowing hundreds of thousands of similarly needy Syrian migrants into the country." If a homeless British ex-serviceman is sleeping on the streets of Leeds, is that the fault of a migrant? Or is it the fault of Social Care and Housing Policy Failure for the last 40 years? Do we blame the migrant - or successive waves of politicians who have failed - are still failing - to address the problem? He stated earlier that UKIP were accused of scapegoating Migrants for everything - and here he is, conflating two totally unconnected issues, and scapegoating migrants. We've had people sleeping rough for centuries. Did Farage say anything 5 years ago on the subject? Or 10 years ago? 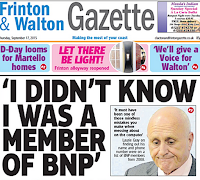 Or did any UKIP politician? Or is it just now, when migrants put it sharply to focus? On Housing, we have empty properties enough to renovate, room enough to build on, workers enough to do the the job, buyers and renters enough to fill the properties. This is Government Ineptitude. With better Economic Management we can quite easily afford to build anew, fund the NHS and new schools (think of all those jobs!) with plenty of room for a certain number of migrants. Sadly we have the Tories in power so won't get it. "The word ‘racist’ is now overused .."
Yes, we do hear it a lot where UKIP are concerned don't we. Wonder why. "Whatever happened to constructive or reasonable argument?" In UKIP? No idea. It died about 5 years ago. UKIP say they are 'different' - yet they are guilty more than any other party of grandstanding fallacy-based rhetoric in lieu of debate. You will recall that this is what Labour's Jeremy Corbyn has asked for an end to. UKIP's response? To step up a gear in personal attacks on him. Reasonable argument? Practice what you preach, UKIP. And the shameful, insulting UKIP performances in the EU are embarrassing to our Nation - neither 'constructive' nor 'reasonable'. Weren't UKIP supposed to be different? Oh, and "constructive or reasonable argument?" - The writer of this piece blocked us on Twitter before we could even post this reply. That's ... constructive. "Overuse of the word ‘racist’ can lead to a distortion of its true meaning." It can indeed. If UKIP we're racist less, we'd use it less. QED. "The knowledge of when to use it accurately and rationally." We're veterans at this and we know racism when we see and hear it. We'll use the word as we see fit. "UKIP’s attitude towards migration is common sense; ethical; and will bring tremendous benefits to the country and its economy." By the way, we're stunned at the number of economic experts within UKIP. Must be brimming with them... or do they all just read the economic argument from your own side? It's very complex. Experts are struggling with it - yet they all seem to have it mastered. "As a direct result of Britain’s membership of the European Union .."
Ah, knew it would crop up sooner or later .. what took you so long? "We face the hugely unfair reality that EU citizens have a far greater chance of moving to and living in the UK than anybody living outside the EU." Correct. Because we have closer links - of every possible kind - with Europe so it's entirely natural. We, in turn, have the right to settle anywhere in the EU but not the automatic right to reside in other non-EU nations. That's reciprocity. Which means any rule we apply to foreign nationals will be applied reciprocally to our citizens. Bear that in mind when you want to retire to the Algarve and they've already taken their quota. We think that's hugely fair, actually. But that's an EU Debate which is off-topic ... for today. "This is not a level playing field, and so cannot be considered an ethical immigration policy." No, it's not level. Not everything is. Even migrants from non-EU nations are not treated equally as one contiguous block. But don't pretend all this is because UKIP feel so sorry for those non-EU migrants we're all missing out on. Does this writer really want ethical? Get your donors and their friends to pay their proper taxes so we can build lots of houses and properly fund the NHS. Don't talk of ethics until your hands are clean. We digress again, but our point stands. "Only an Australian-style points system can invoke sensible vetting of applicants, prioritise the skilled and ensure that net migration doesn’t get out of hand." Interesting one this. Actually we'd be somewhat in favour of a Points System of some kind. It can be another one of the UK's 'opt-outs'. Problem is, that word 'style' hides a lot of sins. We've asked UKIP for 18 months for details of how it would operate, how points would be decided, by whom, for what - with no response. Australia has other methods of residency other than the PBS - so do we only adopt the PBS part? Or just the PBS and the SOL List? Or is the Canadian FSWV system more suited to our economy as many think? Or do we just pick the Australian System - because Nigel says so? How can UKIP expect anyone to be in favour of a plan no-one has ever seen when only one option is ever mentioned? We need to know it will be fair. Let's see UKIP create a White Paper on it and then we'll discuss. Oh, and if UKIP agree that a certain level of Immigration is acceptable and actually good for the economy, perhaps UKIP should stop Official UKIP Social Media Accounts promoting a petition calling for a "Stop To ALL Immigration" ? "Accusing the party of institutional racism brings about unnecessary shaming and vilification of innocent, hard-working UKIP supporters." No doubt there are many hard-working members. But innocent? There is racism endemic within UKIP, as well as many other sins, and those who are not racist simply condone and approve it daily, with silence and compliance. If they want a racist-free UKIP, start vetting candidates properly. Start ejecting members. Dump Anne Marie Waters as a Candidate. [Update: Gone]. Get rid of Vicky Ayling. Let loose Thackeray. [Update: Gone]. Start that process. And then you'll hear the accusations less. Remember the Professional Cycling Drug Scandals? Anyone connected even remotely with performance enhancing drug-taking was gone, overnight. A clean house. That's how to do it. And since then we've had two British Tour De France Winners. "Please think about those of us with honest intentions before tarring us all with the same brush." Interesting choice of phrase, "tarring us all with the same brush". This, of course, is precisely what UKIP have done, consistently, monotonously, with regard to migrants, refugees and muslims, left wingers, and the Germans. The writer is asking for a courtesy his party refuses to grant to others. "I cannot stress this final point strongly enough. When I became a member of the UK Independence Party back in May, after my membership was concluded on the website, I shared my political stance with Twitter. Big mistake. The first three replies I got were direct accusations of bigotry and xenophobia, directed at me by people without even the faintest clue of my views or moral stances." Your views and moral stances are your own. But you publicly support a Party with their own stances. Like it or lump it, you represent them and their views. We don't for one minute accuse you of any of these faults we speak of - but you will see it and you will hear of it. Will you stay silent? Or will you speak out? UKIP has a long, full documented history of racial incidents. UKIP promotes or protects those it knows to be racist. UKIP blames minorities at the bottom for the Social Problems caused by those at the top. Farage's teachers described him as a racist and a fascist. UKIP's founder described Farage as a racist and quoted him as saying "UKIP would never get the n*gg*r vote." The EDL have stated "UKIP are saying what we're saying, just in a different way"
UKIP allies itself within EFD with unashamedly racist Parties in the EU Parliament. So, yes, actually. UKIP are a Racist Party. Social media promoted the recent #BlackLivesMatter campaign to raise awareness against racism. Perhaps I should start my own: #UKIPLivesMatter. Yeah. We like that one better. Apologies for the long post, and if you got this far, well done for working through it all ! !